A solid resume can help you land a great job as a caregiver. Is it time to take care of business and nurture your career growth? A comprehensive resume can assist you in finding top caregiver jobs, says resume expert Kim Isaacs. 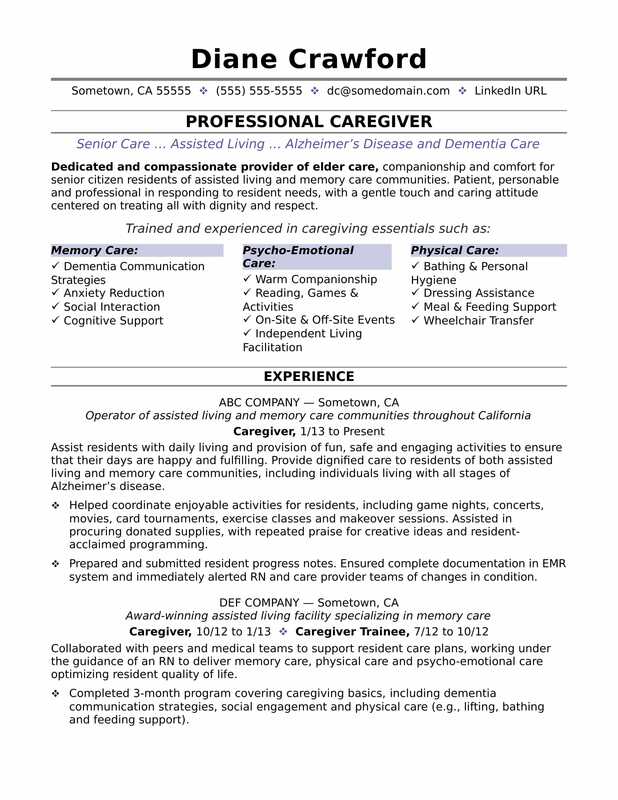 For writing tips, view this sample resume for a caregiver that Isaacs created below, or download the caregiver resume template in Word. Jobs for caregivers and home health aides are projected to grow by an astonishing 41% (or 182,500 jobs), which is much faster than average, from 2016 through 2026, according to the Bureau of Labor Statistics (BLS). You'll find the highest level of employment for this job in the following states: New York, Texas, Ohio, New Jersey, and Pennsylvania; and in the following metropolitan areas: New York City; Chicago; Minneapolis; Columbus, OH; and Houston. As a caregiver, you can expect to earn a median wage of $23,130 per year, or $11.12 per hour, according to the BLS. Additionally, you can learn about healthcare careers and search for caregiver jobs on Monster. Dedicated and compassionate provider of elder care, companionship and comfort for senior citizen residents of assisted living and memory care communities. Patient, personable and professional in responding to resident needs, with a gentle touch and caring attitude centered on treating all with dignity and respect. Assist residents with daily living and provision of fun, safe and engaging activities to ensure that their days are happy and fulfilling. Provide dignified care to residents of both assisted living and memory care communities, including individuals living with all stages of Alzheimer’s disease. Helped coordinate enjoyable activities for residents, including game nights, concerts, movies, card tournaments, exercise classes and makeover sessions. Assisted in procuring donated supplies, with repeated praise for creative ideas and resident-acclaimed programming. Prepared and submitted resident progress notes. Ensured complete documentation in EMR system and immediately alerted RN and care provider teams of changes in condition. Collaborated with peers and medical teams to support resident care plans, working under the guidance of an RN to deliver memory care, physical care and psycho-emotional care optimizing resident quality of life. Completed 3-month program covering caregiving basics, including dementia communication strategies, social engagement and physical care (e.g., lifting, bathing and feeding support). Demonstrated thorough knowledge of communication techniques, infection control, safety, body mechanics and age-related differences while providing compassionate care. As a caregiver, you know that a little attention to detail can go a long way—that goes for your resume too! Could you use some help strengthening your resume? Get a free resume evaluation today from the experts at Monster's Resume Writing Service. You'll get detailed feedback in two business days, including a review of your resume's appearance and content, and a prediction of a recruiter's first impression. Let Monster's experts show you how to boost your resume so that your skills and qualifications stand out from the rest of the competition.